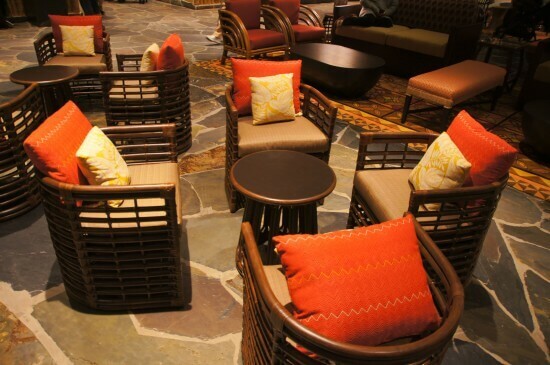 After months behind construction walls, the lobby at the Polynesian Village Resort has now re-opened. 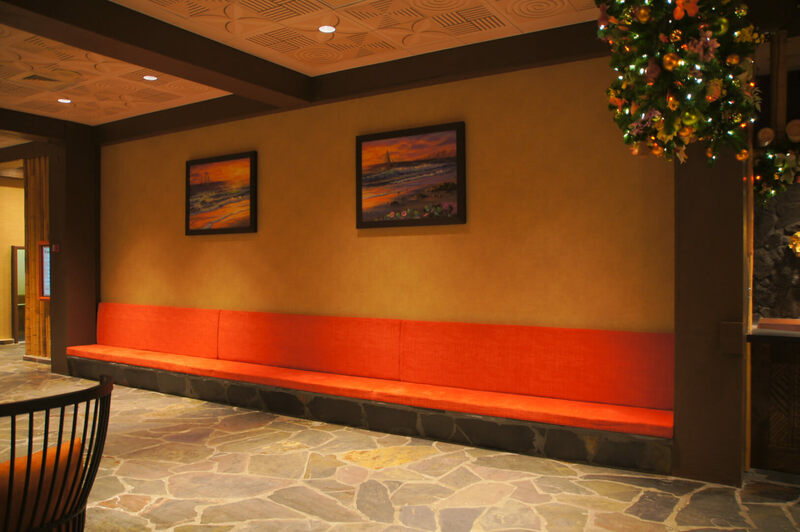 The new lobby now features a much smaller waterfall and lots more seating space, which will surely delight all the guests waiting to check in. 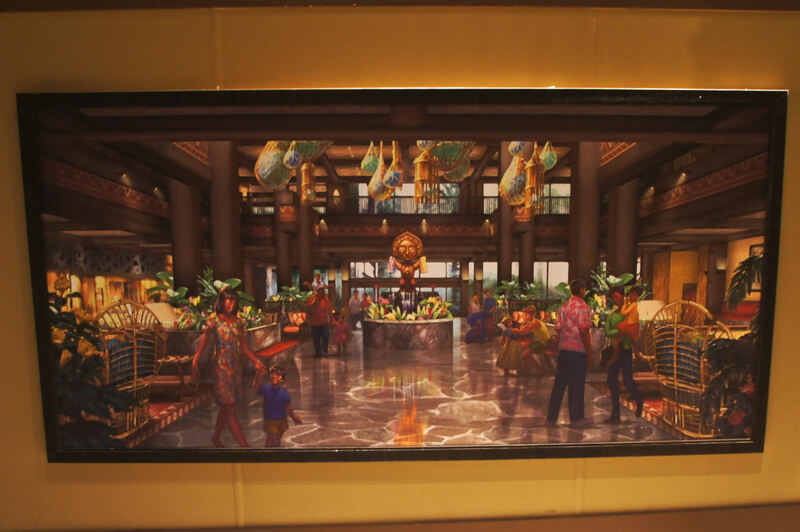 Take a look below for a video walk through of the lobby and plenty of of pictures. 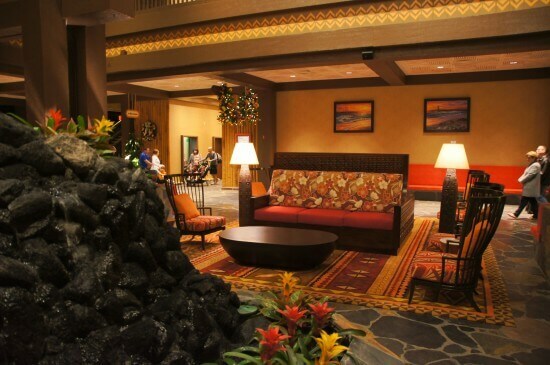 The lobby decor is still very “island” inspired with lots of warm colors and dark wood but now more airy and open. Though the re-modeled lobby has now been unveiled, to both negative and positive feedback from fans, it is not completely finished yet. A large Tiki statue is supposed to be placed by the waterfall later this year and hopefully give the lobby a bit more of a themed look, as many seems to feel like that is missing. 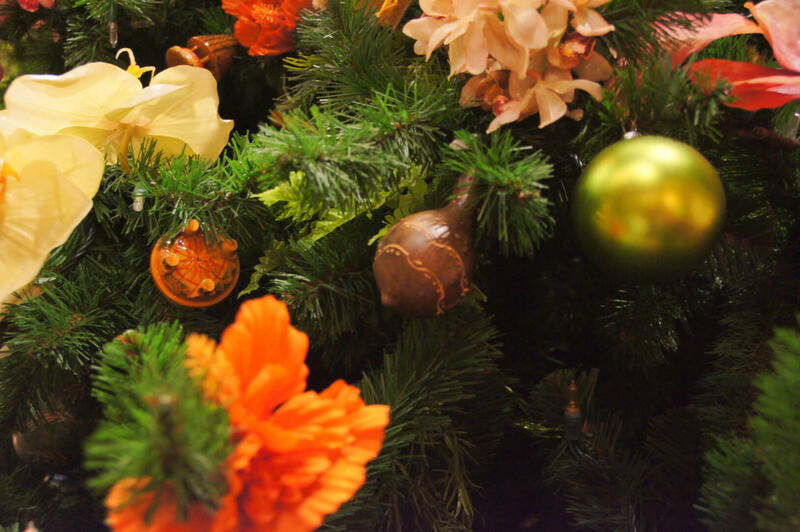 For now, we have the wonderful Christmas decorations to look at, with a large Christmas tree taking center stage by the waterfall. The artwork that shows how the finished product should look with the Tiki statue is even on display in the lobby so guests know it’s not quite done yet. 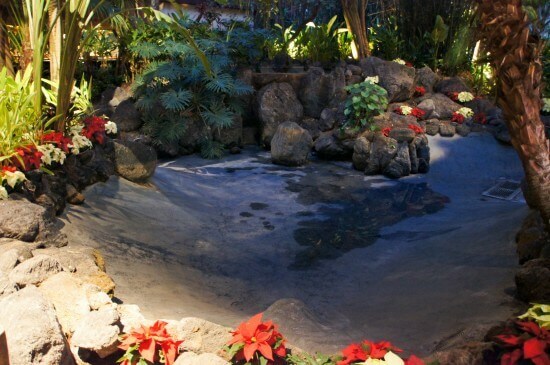 Though it is small the waterfall still gives off a tranquil “Polynesian” sound. 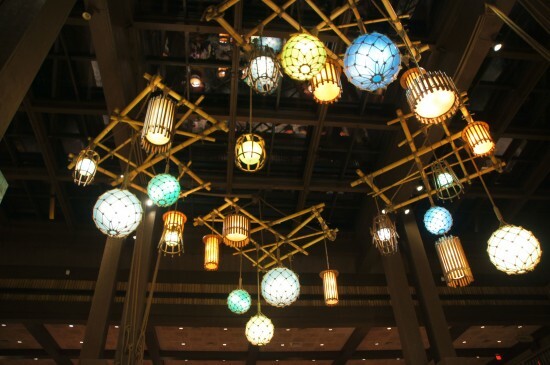 The new light fixtures gives of a dramatic impact when walking in and is one of the nicest updates to the lobby. Can you spot the Hidden Mickey? 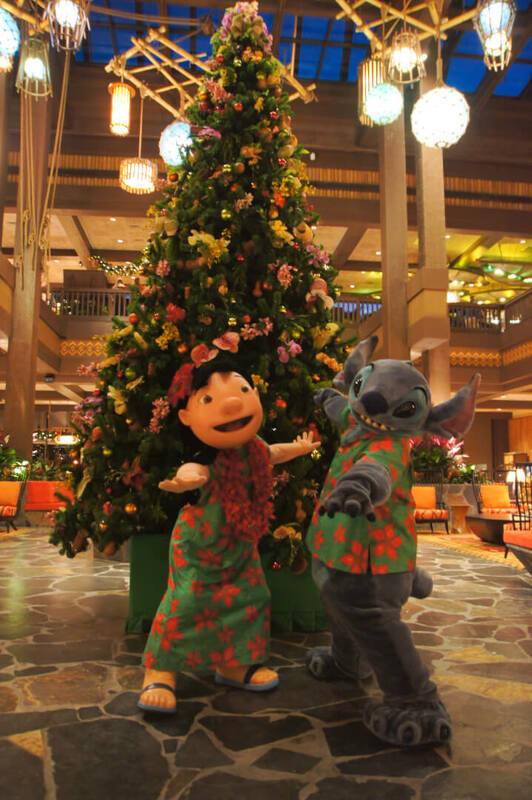 Lilo and Stitch made a visit to the new lobby in their holiday outfits. 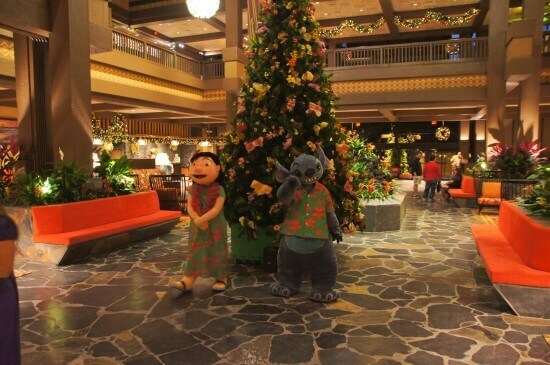 Stitch was very happy with the new look of the lobby. Over by the elevators you can now view some new artwork with some familiar Disney characters like the Small World dolls and the Tiki statues from the Enchanted Tiki Room. Not only the lobby got some changes but we also spotted a new DVC room where the old Wyland Galleries used to be and some new seating outside by the lake. The highly awaited Trader Sam’s Grog Grotto still got some time left before it is finished but some new artwork has showed up outside of its location featuring a very “20,00 Leagues Under the Sea” feel to it. Swedish student at Rosen College UCF lending his videography and photography skills to Inside the Magic as part of a multi-semester internship. 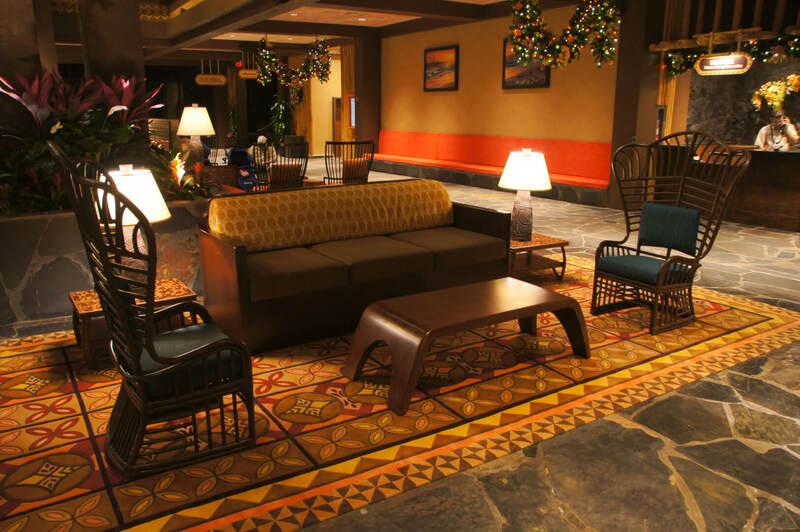 The lobby redesign could not be more of a disappointment. There is nothing that distinguishes this from any other hotel. 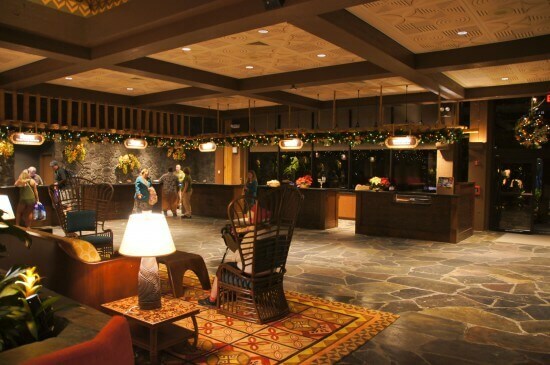 It could be the wilderness lodge or the Yacht Club lobby. The sorry excuse for a waterfall is a waste of space if they were going to have a waterfall they should have kept the one they had. That rushing water sound and the birds they had made it feel like you were in a Polynesian Island. 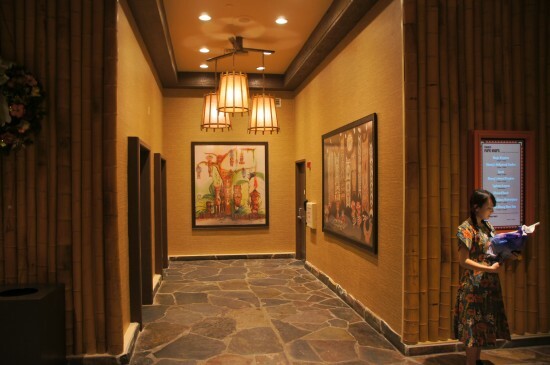 Your average Benihana has a better waterfall inside. I feel like whoever is deciding on changes for Disney Parks and Resort needs to be relieved of their job because all the changes lately appear to have no thought behind them. Completely agree. 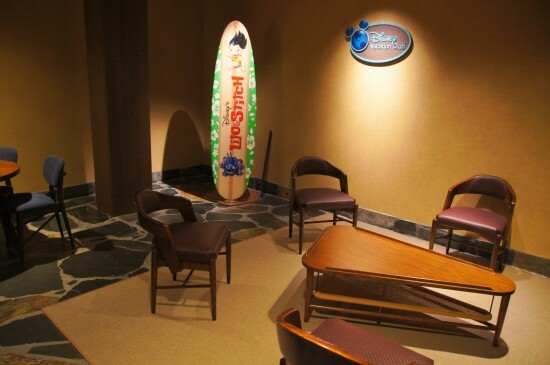 Many of the “upgrades” Disney has been doing has a very generic feel to them. It seems imagination has left the building. Totally agree with both of you…Jason and John. 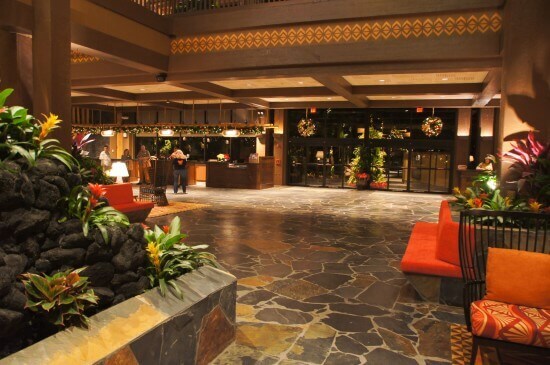 The new lobby looks OK, but it really lost the wow factor of the original lobby. There’s nothing really special about this any more. 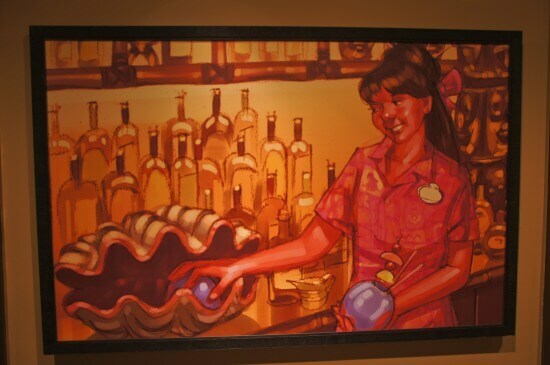 Why didn’t Disney use Aulani spactacular design as inspiration? Seems very sterile. Not welcoming, only functional. 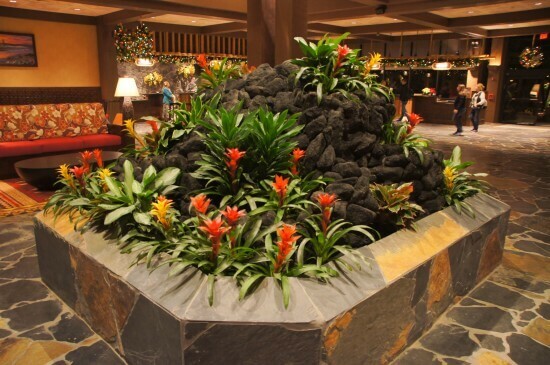 The lost, giant, cascading garden was the heart of the resort, so this represents a major reduction in “specialness”, even if it affords more room. I feel for the unaware long-time Poly loyalists who will return to get blind-sided by this change: like re-visiting a favorite Nature Reserve to find it has been “improved” into to a strip mall. 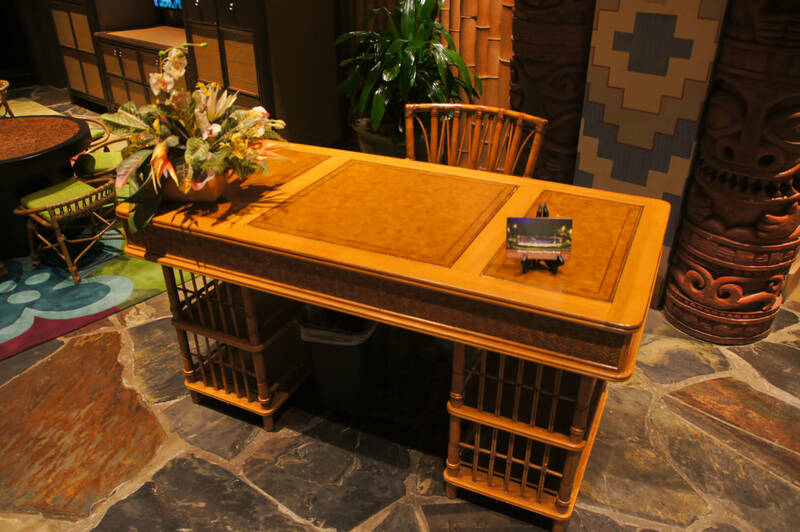 Not to be negative, but this is my opinion: now more than ever I don’t understand why anyone would pay the prices to stay at the Polynesian. 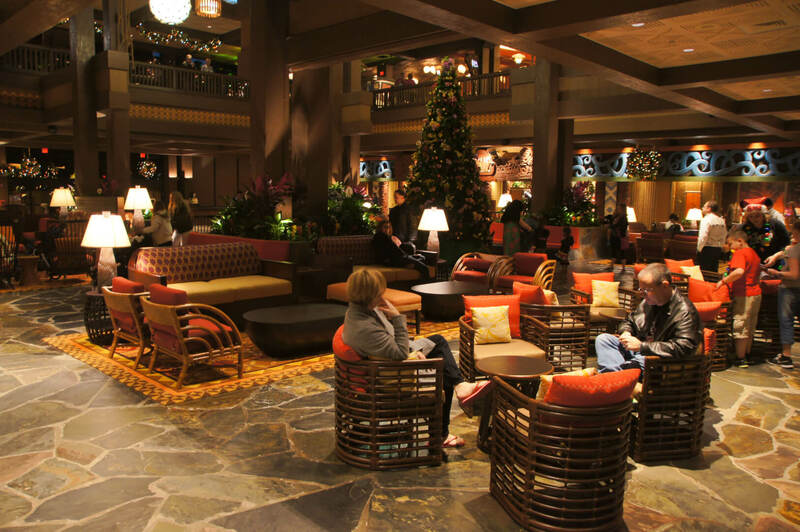 I’ve always thought this place was grossly overpriced, but before they ripped up the lobby area I still kind of wanted to stay there one day. It was always a dream of mine to do that. But, now I just don’t see anything special about the hotel. 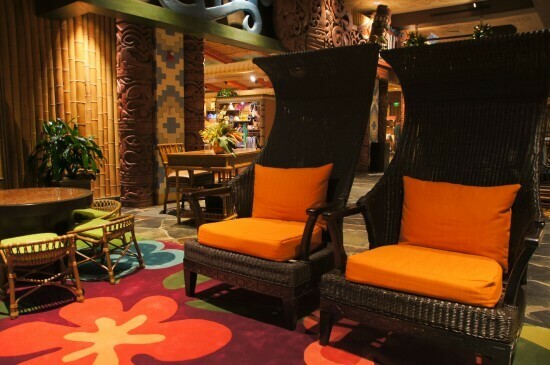 It feels very 1970s to me, not Polynesian. I think they removed everything special about the place and just left the stale 1970s. Bad decisions. Seems very sterile; too open. Not the special warm South Seas atmosphere that was there before. Sorry Disney, you badly missed the mark on this one. Change it before it is too late. Looks pretty unexceptional – about as Polynesian as a shopping mall. They killed it (in a bad way). 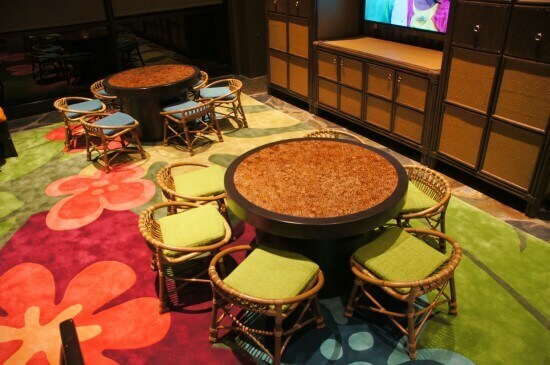 I wouldn’t want to stay there now, there’s no “wow” factor or anything to say “only Disney has this”. I hope Disney sees these comments. A huge failure … They destroyed a classic space. I am so disappointed! The Polynesian lobby lost its unique and grand look. It is sad. I’ve been staying at the Poly since the year after it opened, when rooms were about $40. 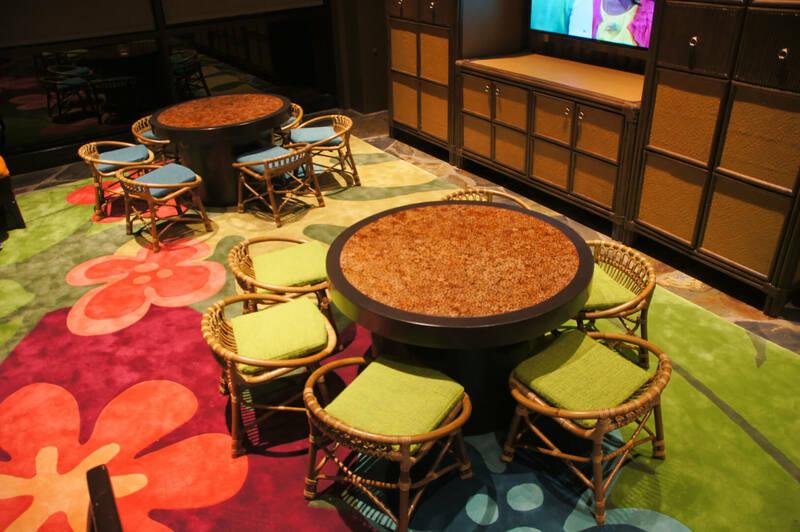 🙂 The new lobby is more “open” and colorful, with a lot more seating, but has lost its unique character. The original large waterfall, with its sights, sounds, and smells, was a commanding presence that made you feel as if you had just entered a lush, tropical paradise. When staying at the Grand Floridian or Contemporary we’d ride the monorail around just to walk through the Poly, soak up the ambience, and perhaps dine. The new one is “nice” but just doesn’t have the “wow” factor. I doubt Walt would be happy. Thanks for all your comments. 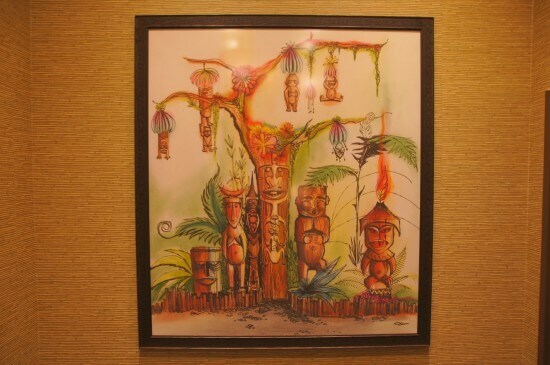 I last stayed at the Polynesian in 2004; loved that waterfall. Seems a shame they “modernised” it. But was very interesting to see the pix and read the comments. can’t express enough what a huge blunder this was. Looks like any place-not magical anymore. Makes me so sad. 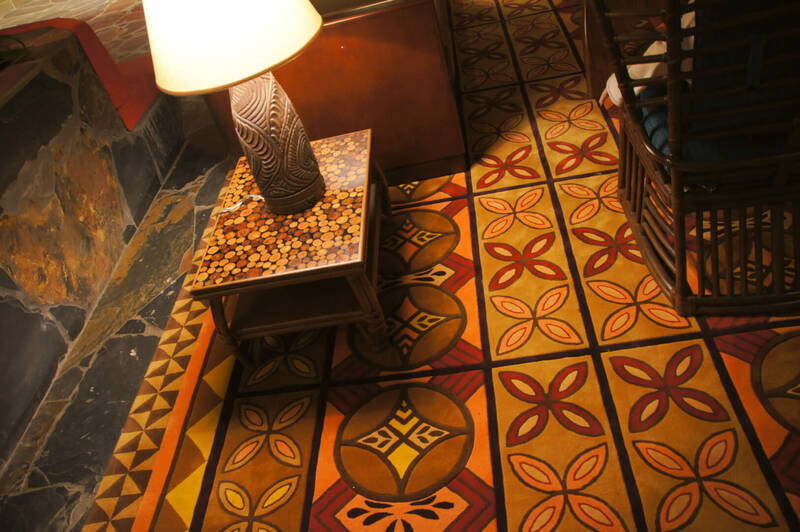 It used to be jaw dropping when you walked in -now it is just a pass through. Very disappointing and completely underwhelming. 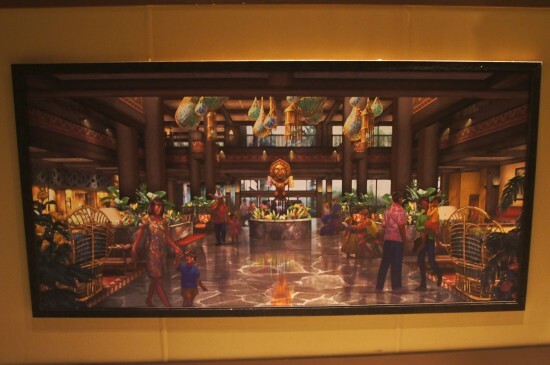 I hope to heck that they plan to finish the water-feature by putting the huge tiki-man up on top of it (as shown in the concept art). Because currently it just looks like a pile of dung. I’m sad. And very sad about the glorious beach views they’ve permanently blocked so DVacationClub could build more villas. The almighty buck rules. What a disappointment! Who approved this?? Tacky and low class. I really think I will endeavor to never enter this lobby again. I’d rather try to preserve my memory of what the lobby of the Polynesian Resort always was — a spectacular yet intimate tropical setting. 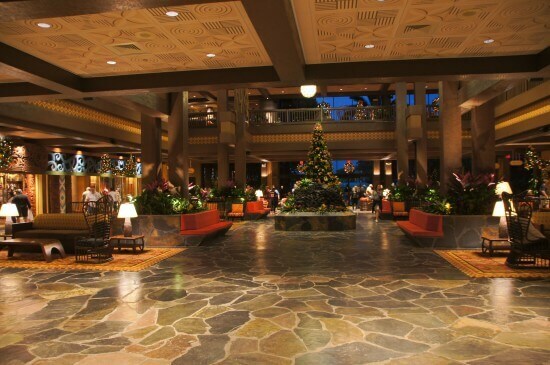 It was truly one of the most unique hotel lobbies ever. I even wish I could unsee the photos above. What an awful decision. 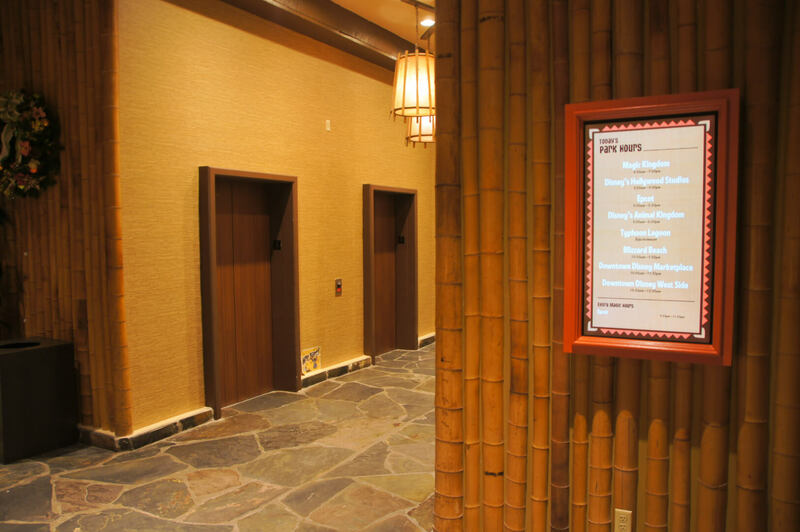 I suppose the next “upgrade” will be to cover over the mosaics on the elevator tower in the Contemporary with large video screens advertising the latest pin trading stations and DVC properties. 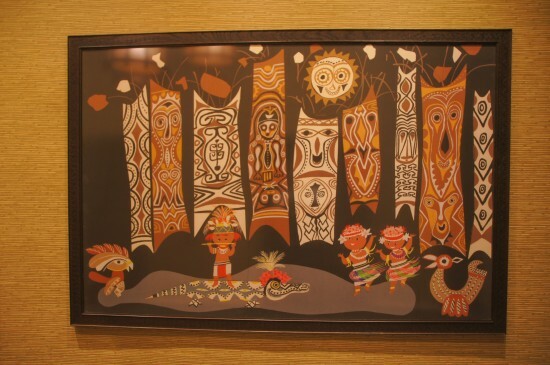 If you guys want to experience that “wow” factor again that the Polynesian once had there is always the Gaylord Resort in Orlando. 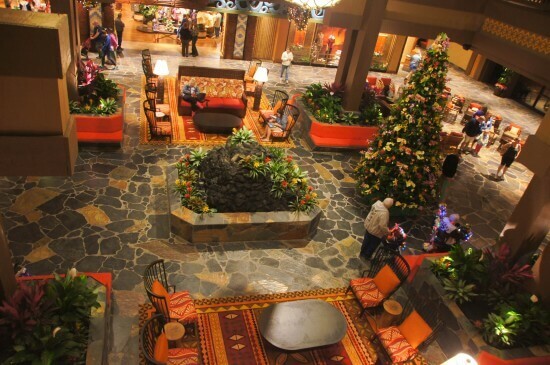 It still amazes me what the Gaylord stuck under one roof. 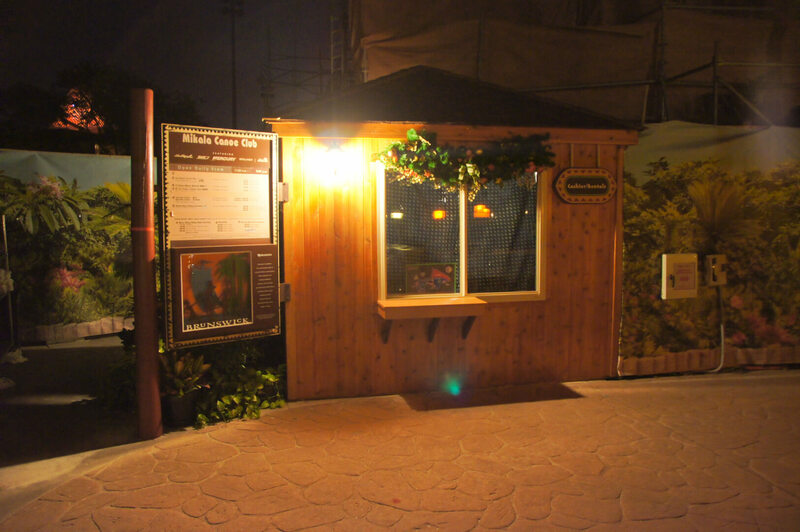 As a shareholder of Disney stock and a regular visitor to WDW, I am very disappointed in this “renovation”. I have a bigger fountain in my back yard. This needs to be fixed, and the idiots who thought it was a good idea need to find other jobs. It is virtually unanimous. 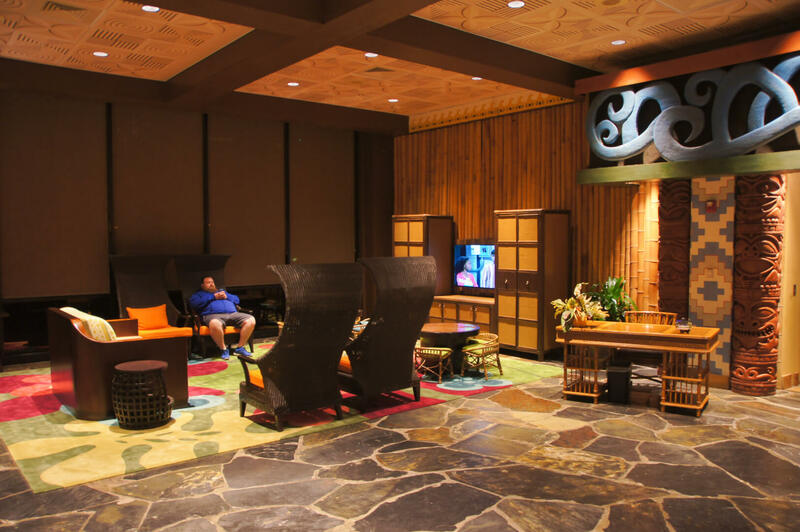 It seems everyone who commented above and has been a long time fan of the Polynesian Village Resort has been let down or bummed out by this awful, uninspired lobby “renovation.” Like some of the commentators, I have had a long history with the Polynesian Village going back to the early 1970’s. It was always a pricey but special place to stay. I remember walking into the lobby for the first time in 1973 and thinking I was transported back to Hawaii or French Polynesia. 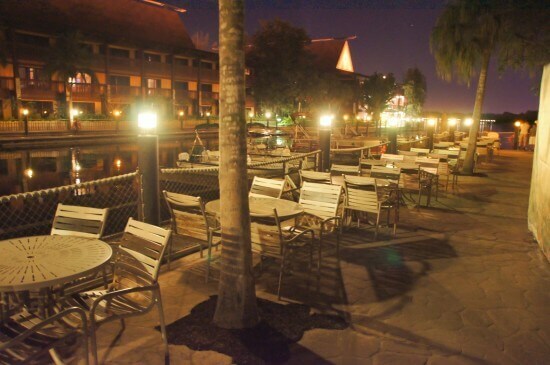 There was a wonderful ambiance to the hotel. A big part of this was the impressive lobby waterfall and garden. 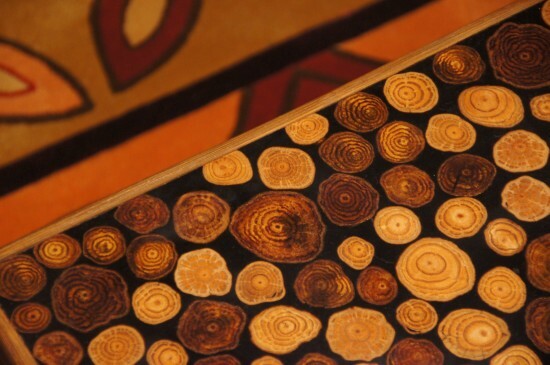 It was unique and really added to the overall feel of the place. Now, it is like any other lobby in a nice hotel. 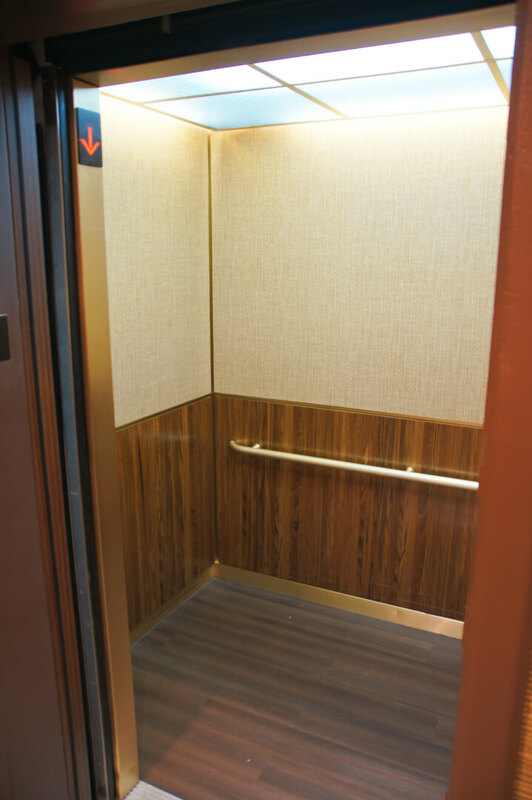 Considering how long they shut down this part of the hotel to make these improvements, I think they did a lousy job. Considering that Disney usually does a first rate if not outstanding job, I don’t get it. However, I believe they made a big mistake here. Not very imaginative by Disney standards. The poly has been ruined!! As a long time fan and annual visitor I cannot rcpress enough how disappointed I am with the changes. 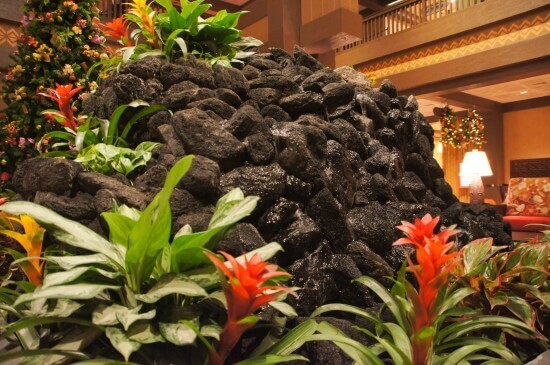 No Coi no parrots the waterfall is now a toy not even worth having in the middle of the lobby. 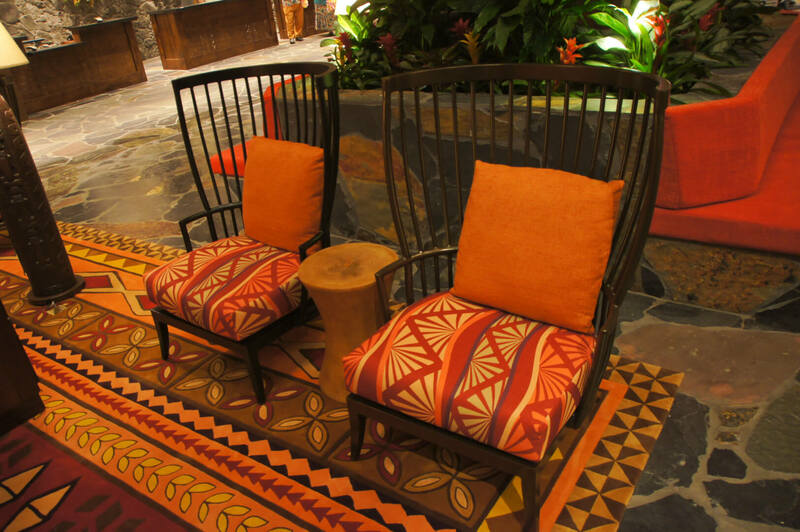 As a vacation club owner, we tried the Poly villas. The new villas are more like a motel 6 . I will not return. 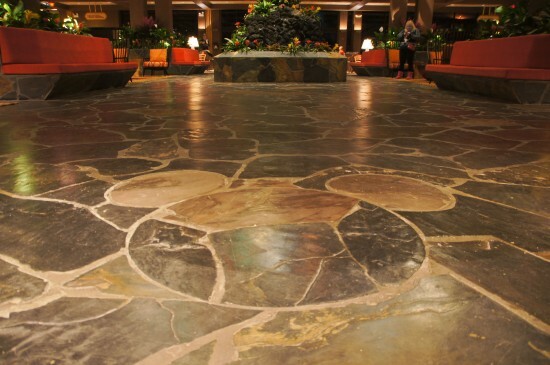 This has been the deal breaker between me and the Disney company– the destruction of the lobby waterfall was a massive mistake and I haven’t wanted to return to Disney to throw my money at them since they did this awful thing. In 1972 I recall my mom fuming because we paid $80 to stay at the Poly, but we weren’t allowed in the room until 2 or 3 pm. 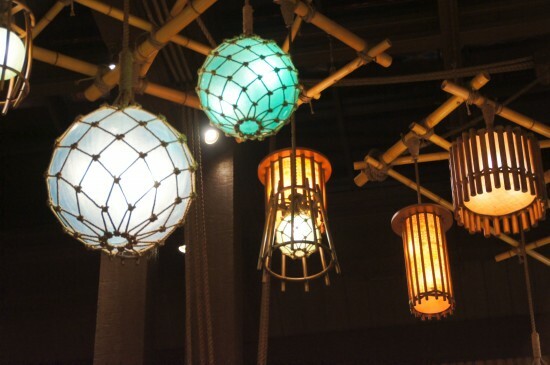 So we had lunch at the Poly and the falls and wonderful atmosphere seemed to calm her down. 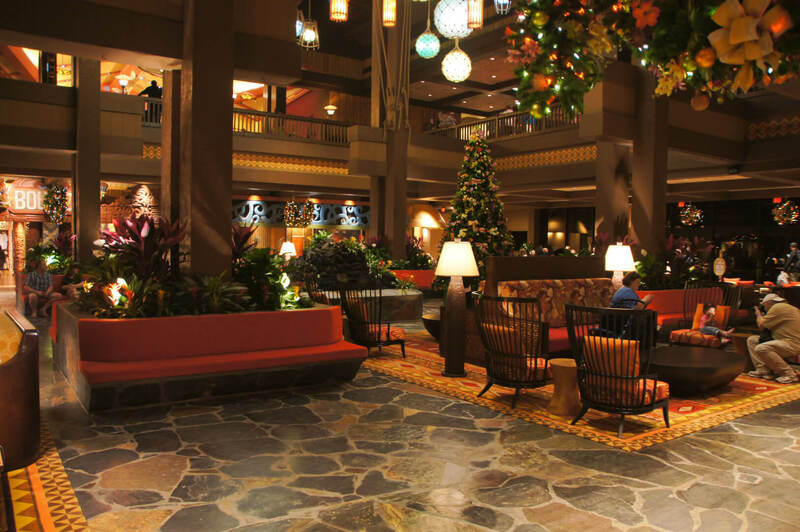 Over the many years on visits, I always had to visit the Poly lobby and just take in that special piece of magic that was the lobby waterfalls. 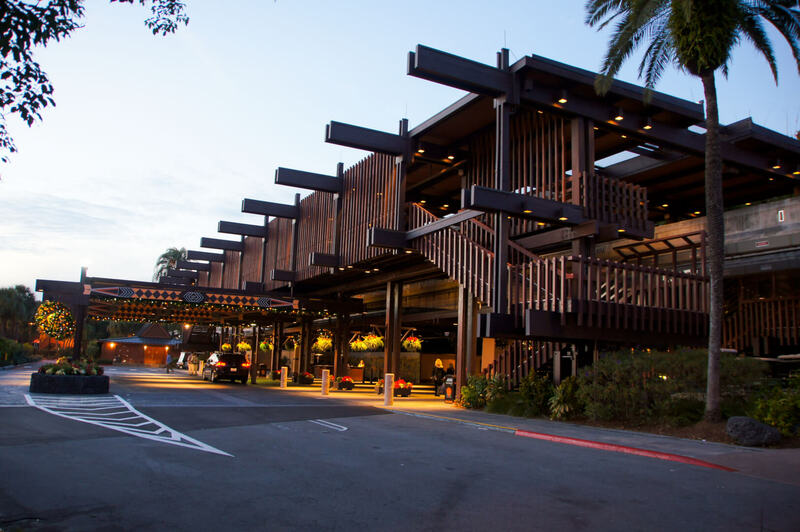 Many memories about getting off the monorail, walking thru the heat and then entering the second floor and seeing and hearing that tropical indoor oasis. So sad it is gone. I haven’t missed the rides that disappeared (subs, swan boats, keel boats, etc. etc.) 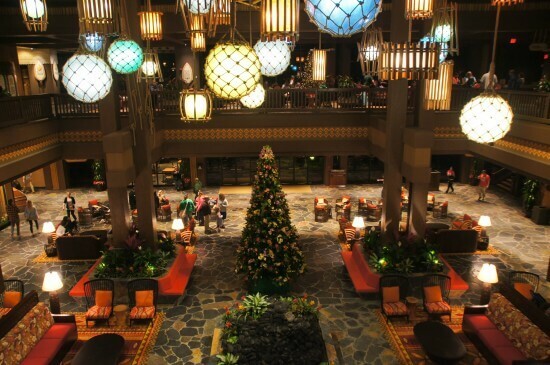 but I do sorely miss that legacy of the Polynesian waterfalls and all the charm and magic they had. What an awful waste. If they put them back I will return with kids and/or grandkids and my walletful of money. Like I said, it is a deal-breaker and the corporate bean counters broke the deal by being cheap and ruining the effect. Very disappointed in the new Polynesian lobby. 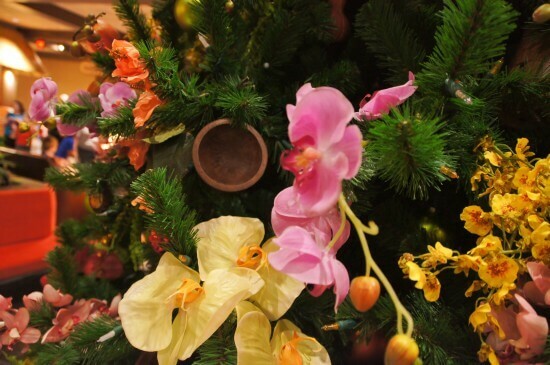 I remember the roar of the waterfall, the giant banana trees, the fish, and the tropical aroma is all gone. I have almost as big of a waterfall in my back yard and I live in Central Illinois. 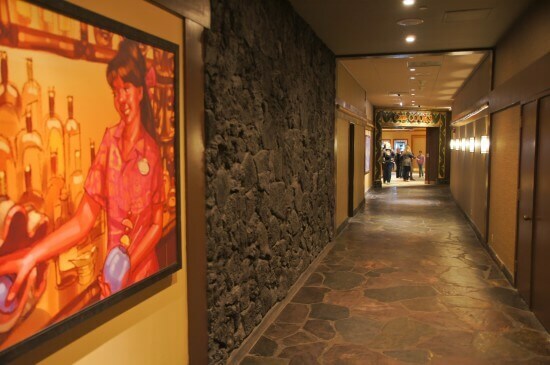 It used to be a wonderful experience just to walk through. 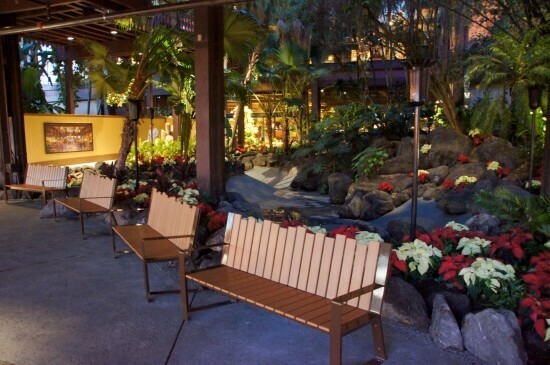 Our local Courtyard Marriott is more tropical than this. 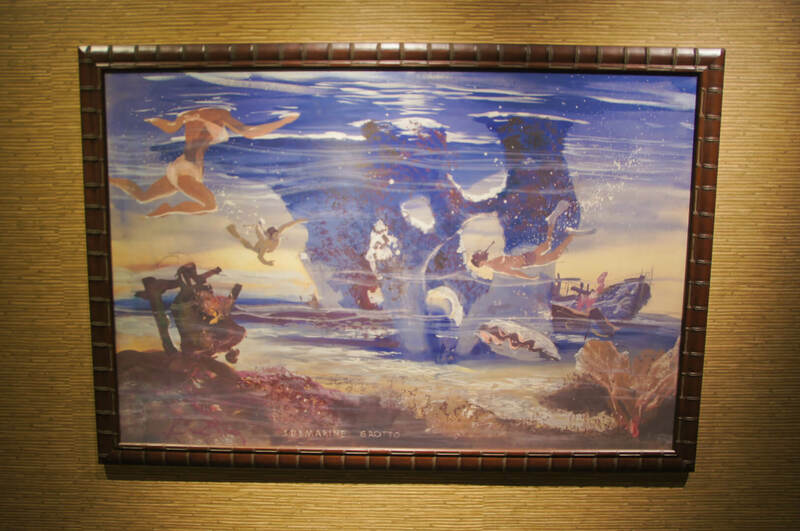 My wife and I honeymooned in Disney World 40 years ago, and had our picture taken in front of the waterfall in the Polynesian lobby. Since then we stayed at the Polynesian eight times having our picture taken in the exact same spot each time. We were very disappointed to see that tradition come to an end.